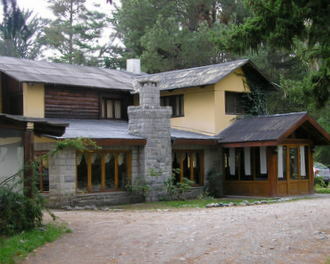 Restaurant Patagonia Celta is set off the street behind towering pines in a very attractive wood, stone and glass building built in Trevelin’s chalet style. As I entered for lunch, Celtic vocal music was playing softly. To my right was a lounge with comfortable couches and chairs in front of a stone fireplace and glass wall. To my left was the dining room with tables of white linen, silver and crystal. Antiques of Welsh settlement days decorated the rooms in understated arrangements, not tourist kitsch. 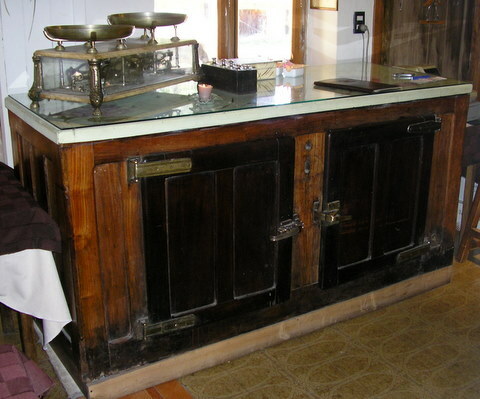 In the service and bar area, a beautiful 6 foot 19th century marble topped butchers ice chest served as the linen and silver storage case. There is a saying among chefs that the dinner guest first eats with the eyes. This appealing environment certainly whet my appetite for the excellent lunch that was to follow. Once more, trying to prevent myself from overeating, I ordered only an entrée, Patagonian grilled Trout with Wild Mushroom Sauce and stir-fried vegetables. 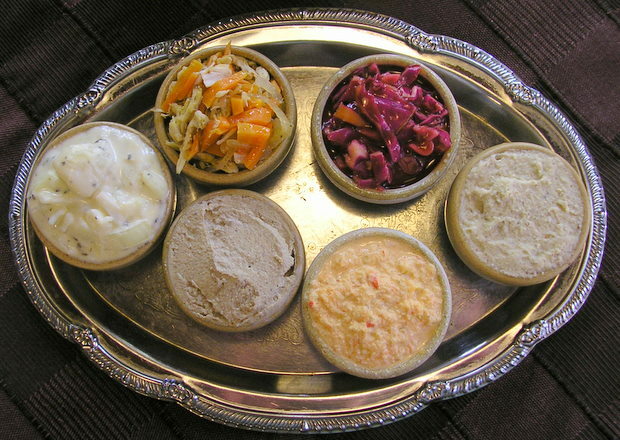 To my surprise, shortly after ordering, a silver tray with 4 oz soufflé cups of six different pates and marinated vegetables, and a basket with a variety of freshly baked rolls and crackers was set in front of me. This platter in itself was worthy to have been listed on the menu as a premium appetizer, yet it was simply a complimentary addition for the breads - I noticed all the tables with the same starter. Liver pate seasoned with balsamic vinegar. Needless to say, I ate every bit of every dish disregarding my weight concerns. The wild mushroom sauce on the grilled trout was excellent. The sauce was a light cream and white wine reduction with fresh herbs and a generous fistful of sautéed wild mushrooms. Patagonian trout stands up very well with a large variety of sauces without loosing it’s own character. The stir-fry vegetables were another surprise. Rarely have I seen them on an Argentine menu. 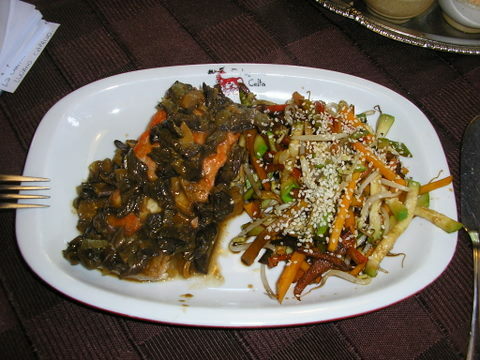 It was a julienne of zucchini, carrots, green and red pepper and bean sprouts with sesame seeds and soy sauce - traditional stir-fry perfectly crisp that paired expertly with the rich tastes of mushroom, cream and trout. 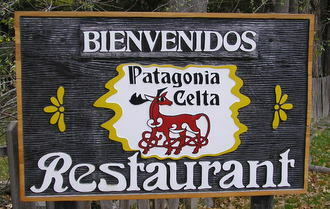 Restaurant Patagonia Celta is definitely on my return list. It was one of two Trevelin restaurants, that were recommended by people in towns far to the south, as well as by the owner of Casaverde Hostel. 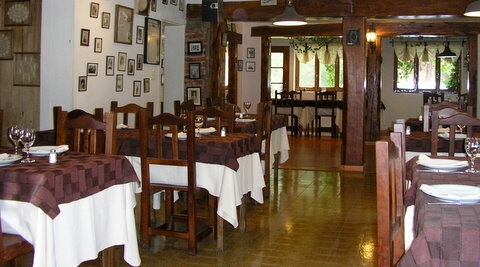 Unfortunately, the second establishment, Restaurant Ruta 70, was closed for the season. But it’s setting outside of town in another attractive building overlooking the mountains hopefully bodes well when I return. The lunch entrée at Restaurant Patagonia Celta, including the starter, cost AR$38 (US$10.50). 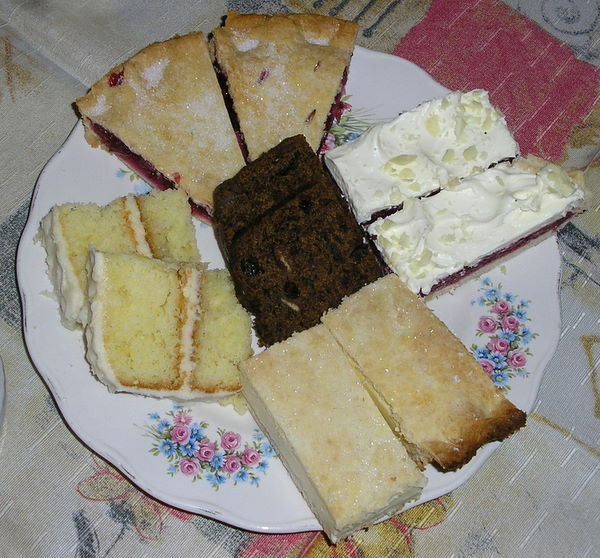 It was a traditional Welsh Tea with white china, linen, two types of buttered breads, scones, three types of tea cakes with cream and raspberry filling, raspberry tart and Welsh tea bread - a dark brown raisin bread. Keep in mind, this is Trevelin, 1,500 miles north of Antarctica, deep in Andean Patagonia, and the Welsh language is being spoken at half the tables. I tasted some of everything, each portion of generous size, unfortunately remembering that I did not want to gain weight on this trip. My young Welsh Argentine friend, Meirion, took the rest back to the hostel. I asked him how often he ate a tea like this at home? Every afternoon between 4:00 and 5:00 PM was his response. How did he stay so trim if this was then followed by a 9:00 - 10:00 pm dinner? He goes out and rides his bike, or gymnastics or rugby after tea. There’s no Welsh gene against fat I presume. Welsh Tea time is a social affaire; it would just be well baked, rich food and excellent properly brewed tea if you had to eat by yourself. Most of the tables were filled with four to eight friends or family conversing and lingering. We stayed for at least an hour and a half as Meirion discovered locals that knew his relatives in Esquel - a common occurrence everywhere in Argentina. Every visitor fortunate to be in one of the Welsh towns must have at least one tea. It’s a unique culinary memory of Argentina. 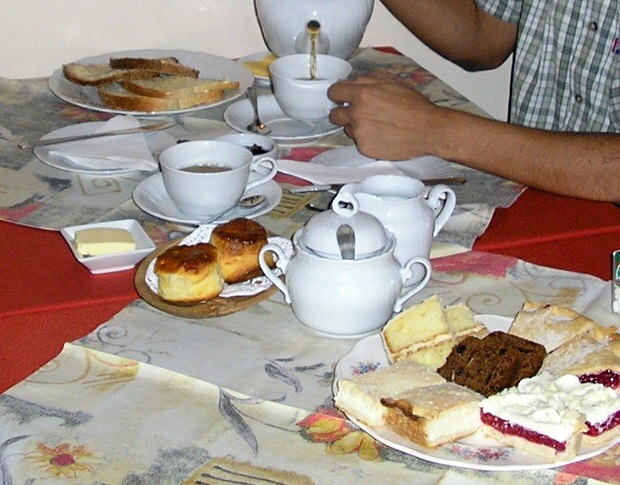 The cost per person at Nain Maggie Tea House was AR$40 (US$11.00).